Mettler Thread stresses excellence in their production and quality control. Mettler's emphasis on quality allows Mettler Thread to meet and exceed the demands that their users place on their cotton and polyester threads. Mettler Poly Sheen Thread is the versatile polyester embroidery thread that meets the highest standards in artistic machine embroidery on any material. Poly Sheen Thread from Mettler Thread is also perfect for quilting. 50% stronger than Rayon, and perfect elongation means high stitch consistency is assured - you won't have to stop working because the thread breaks. Colorfast. 100% Polyester. 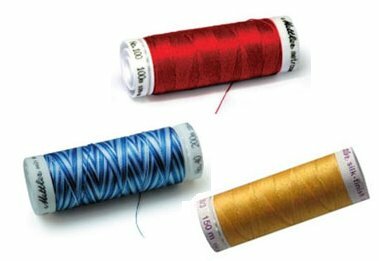 Mettler Seracor Serger Thread, formerly called Metrocor Serger Thread, is an uncomplicated and reliable polyester serger thread that is predestined for classic work. A strong heart wound with fine fibers makes this a true all-rounder. Seracor is strong and resilient to resist breaking and produces even and regular seams on all types of fabric. It is shrink resistant. 50wt Polyester Thread. Mettler Seralene is perfect for creating fine, almost invisible seams on light-weight fabrics. Seralene - the overlock thread with exceptional smooth characteristics, guarantees strong, virtually invisible seams. Thanks to its fine Qualities, Seralene can also be used as an underthread - plus it comes in a wide range of Colors. Seralene offers unrivalled and trouble-free sewability, even on the most sophisticated multi-function overlock machines. Available in 42 fashion-inspired ombre and variegated color combos, Mettler Poly Sheen Multi is ideal for multiple applications including quilting, decorative embroidery, and thread painting. 100% Polyester. Takes its name from its silky appearance, but it is not really silk - it's a premium quality, long staple mercerized cotton thread. Use for all purpose sewing, fashion, peicing, quilting, embroidery and more. Lively colors energize the spirit and turn the monotony of everyday life into a festival of visual delight. Mettler Silk-Finish Multi offers exactly this. Mettler Silk-Finish Multi also proves its strength in demanding applications. This high-quality, lint-free embroidery thread made of double mercerized, long-staple Egyptian cotton is extremely soft and very easy to work with, making it ideal for colorful motifs on both fine and moderate weight materials. This multi-color thread dazzles with its natural shine and harmonizes beautifully with many solid colors of Mettler Silk-Finish. Mettler Metallic 40wt thread is ideal for hand or machine embroidery, and has a powerful and unique glow that will set your work apart from all others.